The 2017 Chrysler Pacifica is an all-new minivan that rides quietly on a unique frame and is powered by a strong yet quiet V6 engine that delivers power smoothly through a nine-speed automatic transmission. The Pacifica is available in numerous trim levels, with the mid-range Touring L trim providing drivers with a range of desirable features without stretching the budget. The top-of-the-line Limited provides an expansive list of standard features that gives the Pacifica a distinctly luxurious style. The Pacifica in Touring-L trim rides on standard 17-inch alloy wheels, whereas the range-topping Limited model comes with 18-inch alloy wheels. The Touring-L models have upgraded exterior trim elements, foglights, LED taillights, and a security system, but the Limited exchanged the standard foglights for LED models and sees an upgrade to xenon headlights. Another distinction between the two trim levels is the addition of power folding mirrors on the Limited, as well as a panoramic sunroof over the first and second row and another one over third-row passengers. The Limited also boasts a powered hands-free lift gate to make loading cargo into the rear storage areas even easier. The 2017 Chrysler Pacifica in Touring-L trim boasts an impressive list of standard infotainment equipment. This system includes a 5-inch touch-screen display, satellite radio, Bluetooth connectivity, and six speakers, as well as both USB and auxiliary inputs. The Pacifica Limited receives a navigation system. Optional on the Limited is an upgraded infotainment system with an 8.4-inch touch screen and a premium sound system with 13 speakers throughout the cabin. The materials of both models have a pleasant flow and premium feel, but the Limited boasts upgraded interior lighting, ventilated seating, and leather upholstery that is an upgrade over that found in the Touring-L. Another distinct feature of the Limited is an onboard vacuum system for quickly dealing with the mess of life on the road. While both the Pacifica Touring-L and the Pacifica Limited are equipped with such safety features as ABS brakes, traction control, stability control, and air bags, the Limited model has additional options available. Choose the Advanced SafetyTec Group to enjoy additional high-tech safety systems such as automatic high beam headlights and precipitation-detecting automatic wipers. Lane departure warning and mitigation systems are also an available option for the Limited, which will keep you in your proper lane while underway and gently nudge you back into the center if the system detects dangerous drifting into another lane without the use of a turn signal. Forward collision detection and mitigation systems are also part of this package for the Limited, which detects vehicles ahead and automatically applies the brakes to prevent a collision. 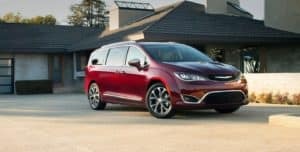 The styling of the new Pacifica in both Touring-L and Limited trims sets it apart from other minivans, with both trims featuring sleek lines, a broad and aerodynamic front grille, and an athletic stance. The interior of the Pacifica in either trim is quiet and refined, with plenty of space for both people and cargo.